This three year project (2009-2012), drawn up by the Moray Firth Partnership, focused on the tradition of hand knitted ganseys in the Moray Firth’s fishing communities as a way of preserving this important part of our culture and introducing the craft – and the area’s wider fishing heritage – to new audiences. 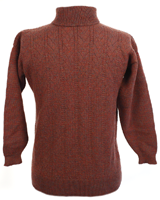 A gansey is a distinctive, seamless, woollen pullover, traditionally worn by seamen and fishermen. It was designed to be practical, comfortable to wear for work, and provide some protection from the harsh conditions at sea. Many early fishing communities are thought to have had their “own” distinctive gansey patterns or pattern combinations. Wearers’ initials or the name of the boat were sometimes incorporated into a design, and if a man was lost at sea, this might have helped identify him. It is really important that old examples of ganseys are not thrown away - it does not matter if they are well worn or patched! We just need to be able to record the patterns and the style so that we can build up a complete picture of ganseys around the Moray Firth and to show the development of patterns in a UK and North Sea context.